With the advent of high end user-friendly mobile devices like Smartphones, tablets, etc., and advancement in technology, the Enterprise mobility is gaining great popularity among the organizations. It can be observed that there are several companies that are making strives to efficiently deploy the enterprise mobility and boost their business values. Indubitably, by becoming a mobile enterprise, an organization can get brighter opportunities. The mobile work-style solution can help you stay ahead of your competitors while driving outstanding growth. For this, you may hire the mobile apps development services from a reliable and highly experienced mobile development company. However, to generate improved productivity without compromising on the work quality, it is imperative to make sure that enterprise mobility management (EMM) has been cleverly perceived and deployed. There are certain crucial factors that must be considered by every organization to ensure efficient implementation of EMM. 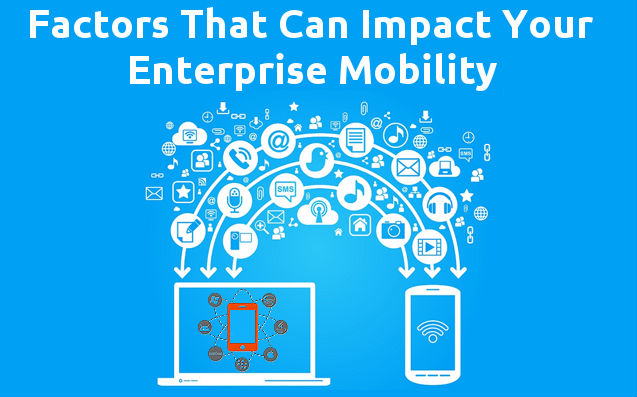 Without any further ado, let's have a glimpse over a few factors that can affect your enterprise mobility management. 1. Application Management can help ensure a secure EMM: This area possesses great responsibilities like managing an application's life-cycle, which primarily includes creating an app, updating it, and eventually removing it when it is not required anymore. It also the duty of app management team to ensure all the security policies. And since, with the interconnection between different resources and end-users increases, the mobile-centric environment becomes more complex, a proficient management framework is required. Hence, it is advisable to choose an EMM solution that possesses ultimate application management with integrated security policies and role-based app distribution. It should be designed to efficiently handle critical functions like jailbreak detection, data encryption, document sharing, reliable productivity apps (including browser, email and more), user authentication and a lot more. Security is a vitally important aspect of any enterprise application. Since an enterprise app often exhibits highly crucial information, it is imperative to ensure the utmost security to keep your essential data away from prying eyes. 2. The Foundational Mobile Device Management is the paramount of EMM planning: There is a plethora of mobile platforms available out there that supports innumerable device types featuring different screen sizes and screen types. Thus, if you will allow your business to implement different mobile devices, then the mobile device management (MDM) must not be ignored. It includes superior functions like security, device set up and mobile's assets management. To handle the critical business data efficiently, it is essential to first identify whether the device seeking permissions to access the corporate device is an employee-owned device or organizational device. This technology is primarily aimed at data security by enabling passwords in device and and automated device setting configuration. It can be said that this factor is quite powerful than any other as it can help you accentuate productivity, augment dynamic access to the corporate resources via some reliable organizational devices. Moreover, when dealt with utmost precision, it can even help deliver optimum results with minimal complexity and reduced IT cost. You can remotely monitor all the involved devices with proficient MDM. 3. Mobile Content Management to keep risk to sensitive corporate data at bay: The file sharing services are quite resourceful features that is often deployed by most of the employees. With this feature, employees gets access to highly sensitive and crucial company information, thus it creates a security risk that can't be ignored. Thus, to ensure an easy access while keeping the corporate content safeguarded, an efficient mobile content management can surely help you. An ideal solution must deploy functions like restrictions for content sharing, intuitive user interface, powerful encryption policies and a lot more. 4. Real time protection from Threats: Resolving a mobile crime could be a daunting task, as these are quite hard to be handled and they have gone beyond malware. Every day a range of new security threats are popping up in the mobile and Internet domain. Mobile applications have become a hot target for hackers. Hence, to ensure security of highly confidential organizational as well as user data, it is essential to create reliable corporate systems that must prohibit unauthorized entry. Therefore, it is imperative that the EMM must feature a robust and dynamic app intelligence functionalities to protect the services and organization framework safe from several risks like malware, data theft, battery drainage, etc. If you are making strives to create mobility standard for enhancing your business performance, these aforementioned key factors can help you conveniently achieve success. A perfect blend of these capabilities can result in efficient Enterprise Mobility Management that can surely deliver rapid solutions with improved productivity and greater user satisfaction. Author Signature: Lucie Kruger is an eminent Senior Content Editor and IT consultant for Mobiers Ltd. She provides concrete information on latest technologies like iOS and android mobile apps development.